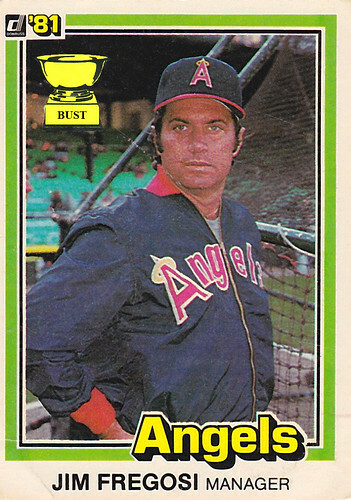 What has Angels manager the late Jim Fregosi so enraptured? (A) He looked to his right and saw a man with more bodacious sideburns than his, and that man was an Elvis Presley impersonator. (B) He looked to his right and saw a real angel, and that angel told him he should be an Elvis Presley impersonator. (C) He looked to his right and saw a man dressed like Elvis Presley with an angel's halo and wings, and that man told him to keep growing his bodacious sideburns. (D) He looked to his right and saw his reflection in a mirror, and thought, "Geez, I'm an Angel with Elvis Presley sideburns."